5 Dollar Liberty piece 14K Solid Gold Money Clip from Aurista Coin Jewelry. 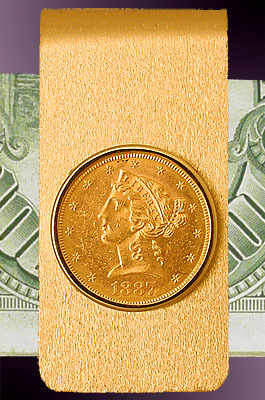 A genuine $5 US Liberty Half Eagle gold coin in extra-fine condition is mounted here in a 14K solid gold money clip frame of traditional design, weighing 16.0g. The 21.6K gold piece contains .242 Troy oz., weighing 8.4 grams. A genuine extra-fine $5 US Liberty Half Eagle gold coin minted from 1866-1908 is mounted here in a 14K solid gold money clip of traditional French fold design, weighing 16.0 grams. Choose Liberty obverse or Eagle reverse as the featured side of the coin. The money clip front is finished in a brush finish. The mirror polished reverse side can be engraved with initials or up to 3 lines of text. Its surface is protected with Aurista's exclusive LensCote polymer. Certificate of authenticity, uniquely numbered signet and limited lifetime warranty included.